The ombré lip trend has now officially reached full pop culture status. And with good reason. It is a fun trend that looks good on anyone, helps make your lips look luscious, fun and definitely larger. FLIRT Cosmetics, the hip line that is all the rage right now, just came out with a color coordinated ombré lip kit that will make it fool proof to do one. It takes the guesswork out of matching the perfect shades and helps you blend your way to your chicest lip creation yet. Each Chic Happens Ombré Lip Kit comes with two expertly formulated, indulgent products that let you rock this trendy look with ease. First, sculpt and shade with effortless precision using the soft-matte finish, creamy Kajal Liner. Then, blend and highlight the lips with the extra-shiny Lip Gloss to make your mouth a masterpiece! These come in three other shade combinations: Neo Femme, Slay All Day and No Shame. I liked this kit. The lipliner kajal went on smoothly, easily and lined my lips like nothing. It was very creamy. Then I blended that in to the middle of my lips. Next I applied the lipgloss to my lips, which is about 2 shades lighter than the lipliner. It highlighted the lipliner beautifully. I really liked how the ombré look ended up coming out. 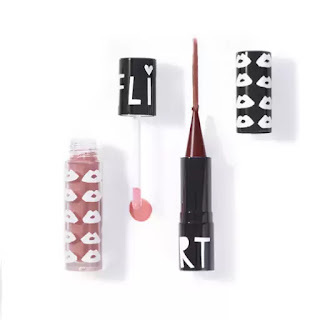 FLIRT Cosmetics is sold online at www.flirtcosmetics.com. Follow Flirt on Facebook: https://www.facebook.com/flirtcosmetics/; Follow Flirt on Twitter:@flirtcosmetics; Follow Flirt on Instagram:https://www.instagram.com/flirtcosmetics/; Follow Flirt on Snapchat: https://www.snapchat.com/add/flirtcosmetics and Follow Pinterest on : https://www.pinterest.com/Flirtcosmetics/.